In the 1950s, the Canadian federal prison system "rehabilitated" female criminals with courses in cooking, cleaning and personal grooming. Unsurprisingly, there were no similar domestic training programs for men within this system. "Men and women are treated differently as criminals," says creative writing professor Padma Viswanathan, who is currently working on a nonfiction book about Mary Lloyd, a notorious Canadian bank robber. "Women tend to be punished twice: first for breaking the law, and second for having transgressed female virtue." Viswanathan and sociologist Justin Barnum will discuss this and other issues related to women and crime in a public lecture that will take place at 5:15 p.m. Tuesday, Feb. 19, in the Gearhart Hall Auditorium (GEAR 26). All on campus and in the community are invited to attend. The lecture will also be streamed live on the Honors College Facebook page. Viswanathan and Barnum will preview the fall 2019 Honors College Signature Seminar "Shedunnit," which will examine female criminality as it is represented in works of fiction and nonfiction. 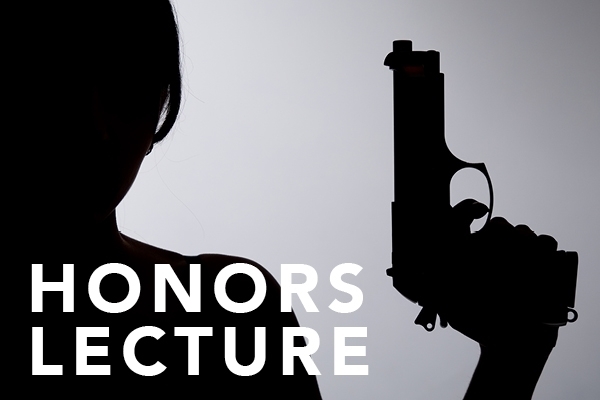 Students will discuss how these representations are rooted in the social consciousness through an analysis of crime and gender that considers such infamous criminals as Patty Hearst, Bonnie Parker and Assata Shakur. "Criminology as a discipline grows out of sociology," Barnum said. "How we define crime is always related to power, to who's defining the laws. It's also about labeling: it's about needing deviance and needing criminality to be able to say that we're not criminals." These social labels depend heavily on a person's motivations and popular perception, which can lead to a disconnect between perceived deviance and deviance under the law. Take Robin Hood stealing from the rich to give to the poor, or animal rights activists freeing livestock from factory farms — though these parties are breaking the law, they and their supporters see their actions as anything but delinquent. Similarly, Barnum says, when people deviate from certain gender norms, a crime can seem more transgressive: a mother, the archetypal nurturer, versus a father, committing crimes against their children, for example. "All of us are trapped by society, in its roles," Barnum says. "In this course we'll try to put the students in the shoes of these women, so they can understand their motivations and purpose in committing a crime." "We see criminals as very different from us," Viswanathan says. "They are intriguing, evil, transgressive. But they are also similar to us, in that they respond to pressures and push boundaries." Padma Viswanathan is associate professor in the English Department's Programs in Creative Writing and Translation, where she specializes in fiction. Her first novel, The Toss of a Lemon, was published in eight countries, and was a finalist for the Commonwealth (Regional) First Book Prize, the Amazon.ca First Novel Prize and the Pen Center USA Fiction Prize. Her second novel, The Ever After of Ashwin Rao, was published in four countries and was a finalist for The Scotiabank Giller Prize and longlisted for the Pat Conroy Southern Book Prize. Viswanathan also writes plays, short stories, personal essays and cultural journalism. Her translation of the novel St. Bernardo, by the late, lauded Brazilian novelist Graciliano Ramos, is forthcoming in fall 2019 from New York Review of Books. Justin Barnum is a visiting assistant professor in the Department of Sociology and Criminology. Barnum's teaching experience includes two years in Cape Verde, West Africa, teaching English while serving in the Peace Corps as a teacher trainer. He has also taught at the University of Central Arkansas, Trinity Washington University, Dickinson College and Arkansas State University-Beebe. Currently, Barnum teaches Honors General Sociology; Race, Class and Gender; Social Theory; and Senior Seminar. His current and recent research projects look at how revolutionary ideas are learned and taught, how people learn to implement a sociological imagination, and how race, class and gender can be taught through experiential learning.